Bold black zipper at neck opening makes for that distinctive look Ezze Wear is famous for. Elbow-length sleeves, extra length for good coverage over the hip w/ functional drawstring off to the side, and in our "travel queen fabric", Honeykomb Crinkle Cotton. The ever-popular top that goes with just about anything you put it with. Very GENEROUS UNISEX sizing. (bust measurments included in Size Selections) LIMITED STOCK Available in sizes S, M, L, XL. Below Hip Length. Approx. 30 inches long. Note on SIZING: Both Long Sleeve and Short Sleeve Zip Tops in Honeykomb Cotton are cut accordingly to UNISEX SIZING, which is larger than Ezze Wear's usual sizing. 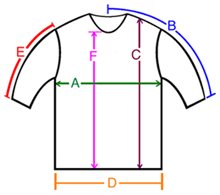 A: Chest / Bust circumference 48-49" 52-53" 55-56" 58-59"
B: Sleeve length from center of neck to end of sleeve 21.5" 23" 23.5" 24"
C: Body length from shoulder to bottom of hem 29" 29" 30" 30"
D: Hem circumference 48" 50" 54" 54"
E: Sleeve length from shoulder to end of sleeve 9" 9.5" 9.5" 10"
F: From the bottom of the V-Neck to hem 23" 23" 24" 24"
I got it in Strawberry and it is very becoming. The sizing is very generous. Norma realized that I did not need the larger size and contacted me to ensure that I received the proper size. I appreciated her attention to detail and professionalism.